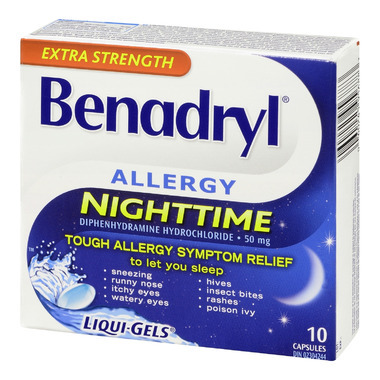 Fast-acting Extra Strength Benadryl Nighttime Liqui-gels provide fast, effective nighttime relief from your allergy symptoms and also helps you rest comfortably. Non-medicinal Ingredients: FD&C Blue No. 1 Aluminum Lake, Gelatin, Glycerin, Opacode solution, Polyethylene glycol, Sorbitol, Water. Was having hives and this worked great. Itâ€™s 50mg, basically like 2 regular tabs and it worked quickly.